The Oued Rmel aquifer, in Zaghouan city in north-eastern Tunisia, extends geographically between 36°18′ and 36°26′ North, and between 10°06′ and 10°24′ East. The groundwater of the Oued Rmel aquifer is exploited for drinking and irrigation purposes. To monitor the chemical water quality, and especially to identify the occurrence and behaviour of fluoride, 23 water samples were collected in January 2013, and analysed for chemicals parameters such as Na+, Ca2+, Mg2+, K+, Cl−, SO42−, HCO3− and F−. 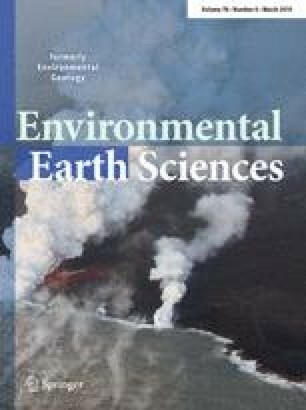 This study applied conventional techniques such as hydrochemical compositions, multivariate statistical methods, Geochemical Modeling and Geographical Information Systems (GIS). Concentrations of fluoride in samples from the Oued Rmel aquifer ranged from 4 to 22 mg/L. The highest values were observed in the surroundings of hydrothermal sources, especially from Hammam Zriba and Hammam Djedidi. Compared with international and national guidelines, all analysed samples exceeded the maximum permissible concentration, in drinking water, of WHO and Tunisian Standards (NT.09.14), which are 1.5 and 1.2 mg/L, respectively. Consequently, up to 75% of the population in the region who use groundwater as a source of drinking water are at risk of developing dental or skeletal fluorosis. Thus, the treatment of fluoridated water through methods such as precipitation, ion exchange, electrodialysis, and reverse osmosis is essential. Fluoride Human consumption WHO Oued Rmel aquifer Dental and skeletal fluorosis Tunisia. The authors would like to express their deep gratitude to the Regional Direction of Agriculture and Water Resources of Zaghouan (North-eastern Tunisia) and the Resources Water Direction of Tunis (DGRE) for their valuable aid during the sampling campaigns.